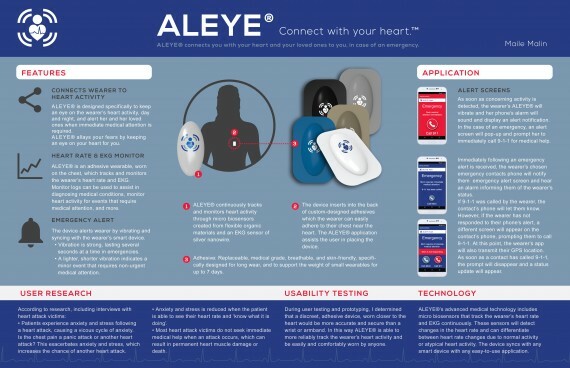 ALEYE is a wearable heart rate and EKG monitor device that connects you to your heart’s activity and your loved ones to you in case of an emergency. The small, wearable device tracks the wearer’s heartbeat and EKG, and notifies the wearer if any heart activity requires emergency medical attention. In the event of a heart ‘event’ requiring medical attention, the companion ALEYE mobile app would instantly alert the wearer with an alert screen containing a “Call 9-1-1” button. At this same time, the wearer’s emergency contacts would receive a notification via their ALEYE mobile app and they would know if their loved one needs emergency medical attention. ALEYE would also notify them if their loved one has called for help or not, as well as instantly offering a CALL button to contact the wearer’s phone. Heart disease is the #1 killer in the world, responsible for 1 in 4 deaths each year. On average women wait 2-4 hours longer than men to get help. Seeking medical attention immediately can avoid permanent heart muscle damage or even save the heart attack victim’s life. In many instances victims are unsure if their pain and symptoms are sever enough to call for help. Often people think it’s not urgent and they can get help by themselves or wait to seek medical attention. 30% of the 15 million heart attack survivors in the US suffer from anxiety or depression. Their fear of having another heart attack can cause anxiety attacks, which can feel like a heart attack, leading to more anxiety. ALEYE would break this vicious circle by allowing the wearer to rest easier knowing what is only an anxiety attack, and letting the wearer know if they need medical attention, allowing them to get help with the touch of a button. In my research I discovered a secondary ‘user’. The heart attack victim’s family and friends benefitted from the companion app by connecting them to the wearer in the case of an emergency. Both wearer and emergency contacts would be connected by the ALEYE device and companion app, allowing everyone to rest easier knowing that ALEYE is keeping an eye on the wearer’s heart activity. My process included interviewing 4 heart attack victims, a nurse, a radiologist, and researching quantitative data via the CDC, American Heart Association, and more. I conducted a competitive analysis of products currently available and researched and discovered many amazing technical materials that could help build ALEYE. I made a customer journey map, discovered many pain points. and created primary and secondary personas. I also constructed low fidelity prototypes and the companion app screens for user testing. As a conceptual project, no impact has yet yet to be determined. However, the heart attack victims that I interviewed all really liked the product idea and said they would wear an ALEYE!